Now that scallop season is over and the water temperatures are dropping ever so slightly, there’s been a definite improvement in fishing. 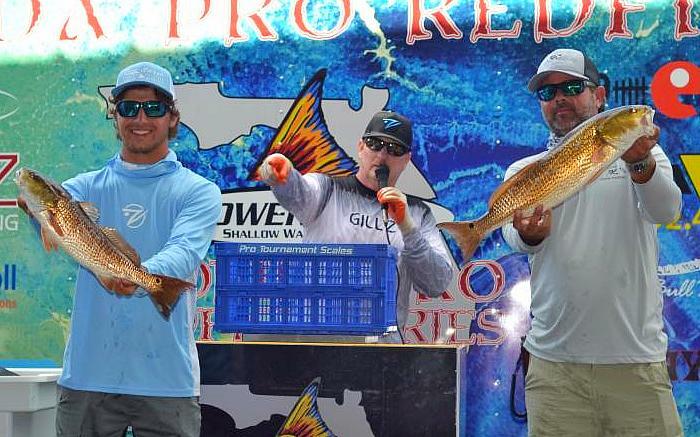 Several tournaments this month resulted in some excellent catches. The floating grass is diminishing and the water is beginning to clear after a number of days without rain. In other words, things are approaching normal for the fall. And the trout are starting to move back onto the flats. 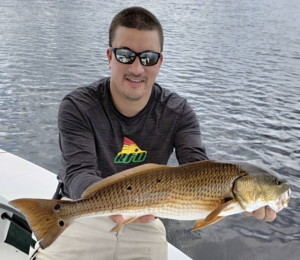 Vinny Phu always catches some great redfish. 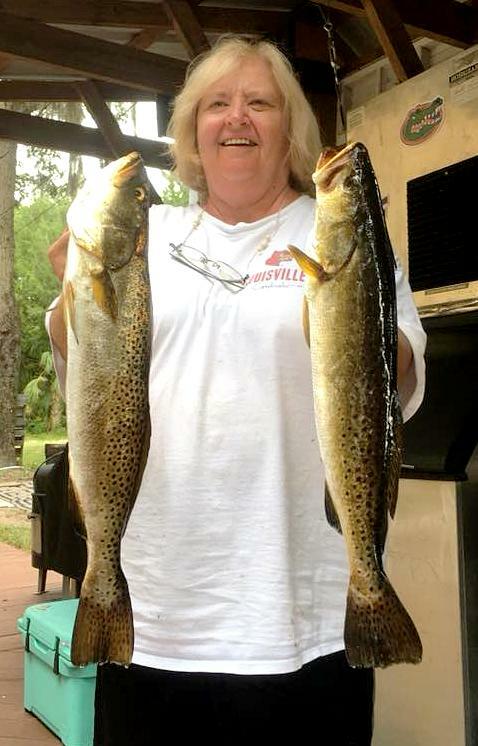 Vanessa Allen with a fine gator trout. Sunshine Mink from St. Augustine with a Spanish mackerel. 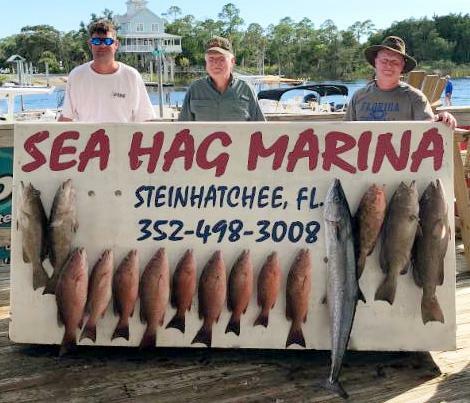 The Sheffields with a great offshore board of grouper, kingfish and mangrove snapper. 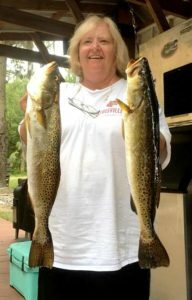 Sharon Cook caught these very impressive trout. Adrian Halley and James Dodd came down from Georgia to catch these two barracuda with a Spanish mackerel as a bonus. 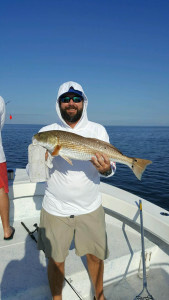 Benson Greer from Kathleen, Ga. with a large keeper trout. 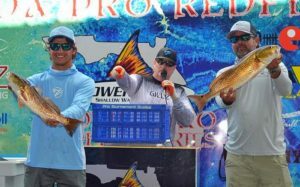 Sea Hag captains Brett Molzen and Scott Peters finished 5th in the Florida Pro Redfish event. 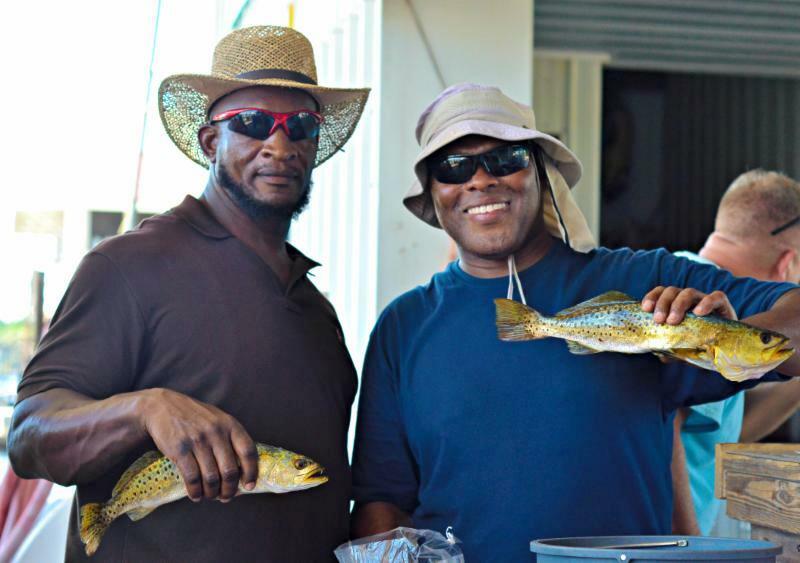 Greg Haggine and Larry Greene also fished the HOH event and caught some trout. James Verrier caught this massive bull redfish in heavy grass. Jesus Lopez proved that it’s true! Snook continue to move north into our area. 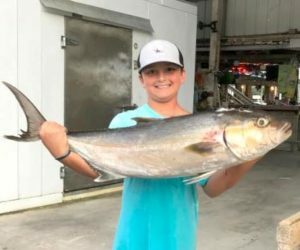 Jed Rountree fought hard to get this keeper amberjack. 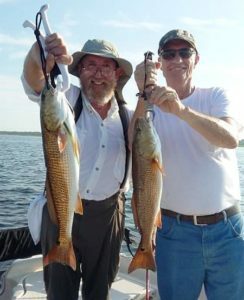 John and Don doubled up during the veteran’s event. 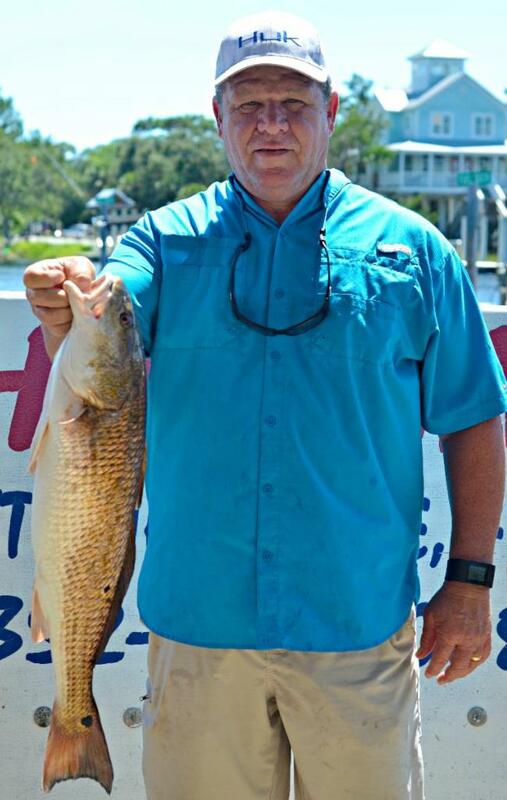 Keven Hewitt caught the heaviest redfish in the Santa Fe Lady Raiders tournament. The Hooked on Heroes Veteran’s Tournament paid off for Joe Carr, who caught the second largest trout. This is one of my four favorite months of the year for fishing. 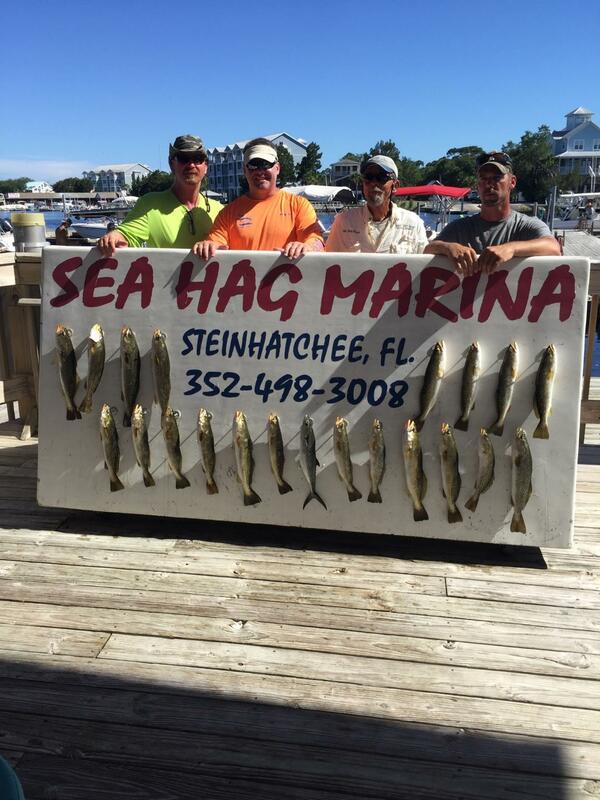 Temperatures are moderated, the water is clearing (already cleared in some places), and the fish are active. We may see the start of a mullet migration, and redfish are beginning to school. 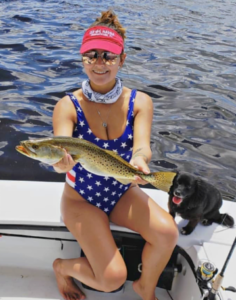 Although right now there are some over deeper flats, along with lots of sand trout, spotted sea trout will move onto the flats from their deeper water hiding places, where they’ve been cooling off. They’ll be fattening up for winter, so they are more active. 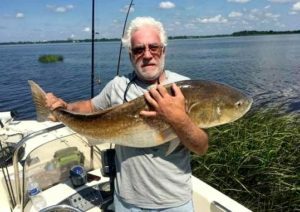 It’s a great month for topwater fishing in shallow water, and using suspending lures or jerk baits for both redfish and trout. 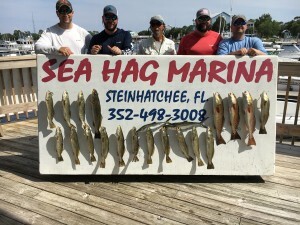 I particularly like the Heddon Saltwater Spook Junior or Rapala Skitterwalk for topwaters, and Live Target sardines for suspending lures, but there are many options available in the Sea Hag Ship’s Store. Look for schools of mullet and whitebait in the early morning or at dusk, and make long casts when fishing with lures in shallow water. Look for schools of redfish schooling in 3 to 5 feet of water, then moving in closer to shore when the tide floods. 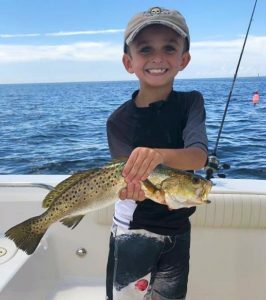 When the trout get to the 3 foot flats, popping corks will start producing when tipped with jigs and Gulp baits, or with live shrimp. Our live shrimp have been small over the summer, but they should be increasing in size. 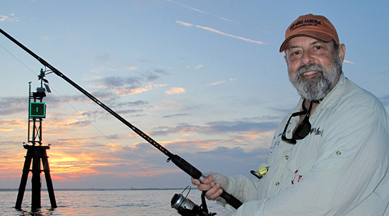 If they are available, spend the extra money for “select” size; you’ll catch bigger fish. 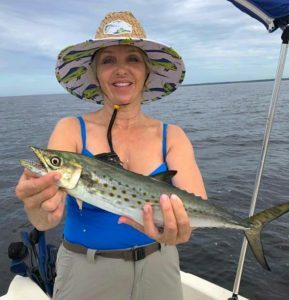 Nearshore, there have been some really large Spanish mackerel caught by folks targeting deep-water trout, but the migration should offer plenty of opportunity to catch some big ones. 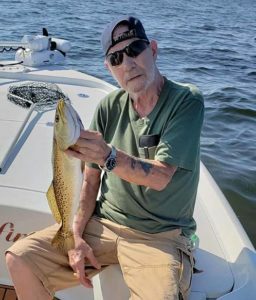 If you see migrating whitebait schools, troll bucktail jigs or small spoons around the schools, or drop down a chum block near one of the offshore bars (One-way, 9 Mile Bank or Little Bank). Don’t forget to have at least a foot of wire leader. 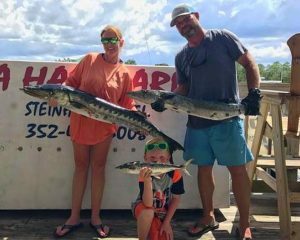 Offshore, amberjack and gag grouper are open and there should be plenty of kingfish around as well. 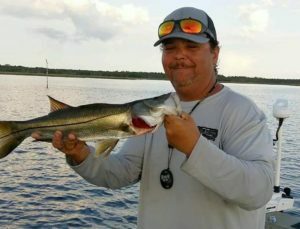 With moderate temperatures, live pinfish and cut bait should be very productive over hard bottom in 40 feet and deeper. 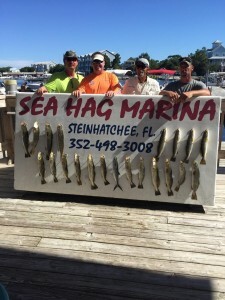 Fish a live bait (pinfish or small grunt) under a cork for passing cobia and kingfish. October’s a great month, one of the best, so make your reservations and let’s catch some fish.